NANITA CUIZON from the Philippines is a housewife and she takes care of her husband and children every day. In the latter months of 2015, she felt abdominal pain and she experienced vomiting which she thought was just a small problem. However, the diagnosis result shocked her and her family. She was diagnosed with liver cancer stage 3. The doctor told her that she only has 6 months to live. She underwent CT scan and MRI at St Luke’s Hospital and was suggested to undergo operation to remove the tumor but she refused because of the high risk of open surgery. What made her more hesitant was that a friend of her husband who was diagnosed with colon cancer underwent surgery, chemotherapy and radiotherapy however he still wasn’t able to make it. Since she refused to undergo open surgery, her family tried to find other cancer options for her. Coincidentally, her husband learned about Modern Cancer Hospital Guangzhou through the Internet which offers 18 minimally invasive technologies for cancers, different from the traditional surgery, chemotherapy and radiotherapy. The advanced technologies and equipments at Modern Cancer Hospital Guangzhou deeply attracted NANITA and her familiy’s attention. Later , she learned that a friend of her husband also took cancer treatment at Modern Cancer Hospital Guangzhou and gained a good therapeutic effect. These reinforced her decision to undergo treatment at Modern Cancer Hospital Guangzhou. 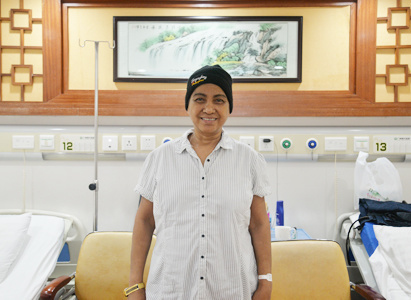 On January 29th, NANITA arrived at Modern Cancer Hospital Guangzhou with her family. The MDT (multi-disciplinary team of doctors) evaluated her condition and made a comprehensive treatment plan which comprises of interventional therapy, microwave ablation and cryotherapy. On February 1st, she underwent the first interventional therapy. She said that before the procedure she was scared and told the doctor that she wanted to sleep and not take treatment but her husband comforted and encouraged her. After taking the first session of interventional therapy, her symptoms of pain and vomiting were gone. What surprised her most was that interventional therapy did not bring any side effects to her. During the first treatment course, she took one session of interventional therapy and cryotherapy, and the symptoms of pain and vomiting disappeared. 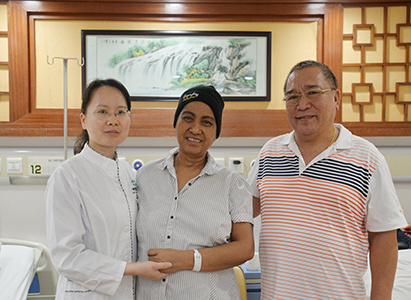 Since NANITA improved on the first course of treatment, she and her husband came back to Modern Cancer Hospital Guangzhou on March 2nd for the second course of treatment. At this time, NANITA felt at ease and relaxed about the treatment. She took one session of interventional therapy and microwave ablation. Before discharge, her attending doctor brought them good news that 60% of tumor tissue was destroyed. They never thought that the treatment would deliver that significant effect after two courses in one month’s time. On April 4th, NANITA and her husband came back for the third treatment course. She underwent one session of interventional therapy. Now she does not feel any nervousness about the treatment. So far, she has taken 3 sessions of interventional therapy, one session of microwave ablation, one session of cryotherapy and one session of . Dr. Lin told us that 80% of the tumor was destroyed. NANITA feels elated that her treatment yield such significant result. NANITA‘s story proves that minimally invasive treatment can effectively help alleviate the symptoms and shrink the tumor so that survival time can be prolonged and cancer patients can return to their normal lives. Liver cancer, liver cancer stage 3, liver cancer treatment, microwave ablation, interventional therapy, cryotherapy， natural therapy， Modern Cancer Hospital Guangzhou.